We are at Malvern today and must finish our display for judging at 5pm. 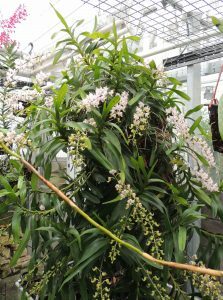 Centre stage is our massive Aerides odorata shown here in the greenhouse where it somehow didn’t look as big as it did when we tried to get it into the van. The species is native to the Himalayas where we have seen it growing in open lowland forest in Arunachal Pradesh on tall trees. 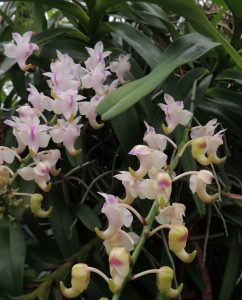 We grow the species in Warm Asia hanging from a basket and watered well throughout the year. 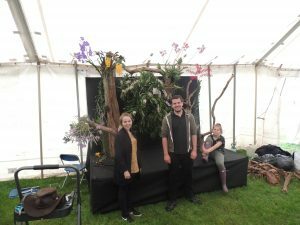 By yesterday evening the tall plants were all positioned on trees at the back of the display and there will be more updates throughout the show. 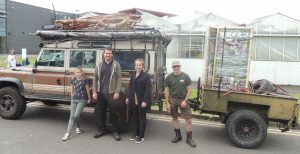 Big thanks to Garthe for making this show possible – and his amazing Landrover and trailer.